Was the fall of Jerusalem “good news”? How could Jesus describe the coming fall of Jerusalem as “this gospel of the kingdom”? That was going to be – and was – horrific! And yet, when one considers that event in light of the OT prophecies of the New Creation, it becomes increasingly evident why and how Jesus could describe the coming dissolution of the Temple and the City as “this gospel (good news) of the kingdom.” For brevity, I will only consider one Old Covenant prophecy of the coming New Creation, Isaiah 65. There is little doubt that Isaiah 65 is a pivotally important prophecy for the NT writers. Paul cites it to justify his mission to the Gentiles as a result of the unbelief of the Jews (Romans 10:20-21). It likewise serves as one of the sources for the doctrine of the salvation of the remnant (65:8). Both Peter and John cite Isaiah 65 in their predictions of the New Heavens and Earth (2 Peter 3 / Revelation 21). But notice that in Isaiah 65, YHVH is emphatic that the marvelous New Creation would come at the time of the destruction of the Old Covenant World, when “the Lord God will slay you” (65:13). This was the fall of Jerusalem. A quick anecdote. Some years ago, on PalTalk, I was engaged in a discussion with a Jewish rabbi. We were discussing Jesus as Messiah and the creation of the New Covenant people. I made a comment, without immediately documenting it, that even the Old Covenant foretold the end of Old Covenant Israel. The rabbi was immediately incensed and challenged that statement (rather acrimoniously, I might add). He demanded to know the ground for my comment. I read Isaiah 65:13: “The Lord God will slay you.” He grew even more agitated and said, “to slay does not mean to kill or destroy!” When I challenged him to document that rather amazing claim with some proof, he disappeared from the discussion. The very fact that he would claim that to be slain does not mean to kill or destroy was more than sufficient proof to prove that he was beyond desperate. ✪ The declaration of Israel’s rebellion, and the consequent prophecy that the Lord would punish her, and call the Gentiles, a people that did not know Him, to Himself. ✪ The promise of the salvation of a remnant. ✪ The promise of the Messianic Banquet, i.e. “My servants shall eat, my servants shall drink”, etc.. This is a resurrection prophecy (cf. Isaiah 25:6-8)! ✪ The promise of the New Creation, the New Heavens and Earth, the New Jerusalem. A full discussion of this fantastic prophecy is beyond the scope of this article. However, what I want to show is that the destruction of Old Covenant Israel, the fall of Jerusalem – which meant the destruction of the City – would be the foundation for the arrival of the New Creation. Just like the promise of the New Creation demanded the destruction of the Old (it shall not be remembered or come to mind), the New Jerusalem called for the destruction of the Old. So, when the Lord promised to create a New Jerusalem, this implied the destruction of the Old City, and that is Matthew 24. There is an important point here. All three futurist views of eschatology posit the end of the age, with the attendant judgment, coming of the Lord, the resurrection and the New Creation at the end of the Christian age. Not one of them posit the destruction of the church at the so-called “end of time.” Not one of them says that God will “slay” the church and create a new people with a new name at the end of the current Christian age! Do you catch the incredible power of this? Isaiah 65 is the key source of the NT predictions of the coming New Creation! 2 Peter 3 and Revelation draw directly from it. Well, if Isaiah 65 is the source and ground of the New Testament predictions of the coming New Creation, and if Isaiah 65 does not predict the coming destruction of the church as the people of God, with the attendant creation of a new people with a new name, then it is patently wrong to say that the New Creation anticipated by the New Testament writers was a prediction of the coming end of time foretold by Isaiah. In other words, if Isaiah did not predict the end of the Christian age, it is wrong to apply 2 Peter 3 and Revelation to some end of the Christian age since they were both looking for the fulfillment of Isaiah. And there is more. If the eschatology that you proclaim does not teach that the New Creation comes at the time of the destruction of the Old World of Israel (“the Lord God shall slay you”) then you are teaching a different eschatology from that of Isaiah. If you reject the idea that the New Creation only comes at the time of the destruction of Old Covenant Israel, you are rejecting the words of Isaiah. Given the fact that the NT writers are emphatic that their eschatological hope was nothing but what was foretold by the OT prophets, (cf. Acts 3:23f) this means that unless you can produce some OT prophecy of the destruction of literal, material “heaven and earth” and the creation of another physical “heaven and earth” – all of which is different from Isaiah 65-66 – then your eschatology is false. 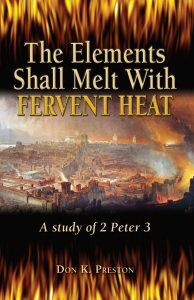 “While 2 Peter 3:13 is definitely related thematically to Isaiah 65, it is a mistake to think that there is an exclusive relationship between the Isaiah passage and any New Testament usage, as if Isaiah were giving a unique prophecy of a unique event in the future, and then Peter and John were announcing the fulfillment of that one predicted event on their horizon (or at any time in the future). It is not that Isaiah announced “X,” and that Peter and John were saying “the time has come for X,” after which time “X” is done and gone.” (You can read some of McDurmon’s claims in regard to 2 Peter 3 here: https://americanvision.org/5523/the-promise-of-his-appearing-2-peter-3/). A book of that debate, as well as DVDs or Mp3s are available from me..
McDurmon, who follows in the footsteps of other Postmillennial writers, was claiming that while 2 Peter and Revelation contain similar themes and is related to Isaiah, that in reality, 2 Peter 3 and Revelation are not predicting what Isaiah 65 predicted! Of course, that is a rejection of the words of Peter who said: “according to his promise, we look for a new heavens and a new earth” (2 Peter 3:13). Peter was in fact looking for what Isaiah predicted. How does all of this relate to our question, How could Jesus call the destruction of Jerusalem the ‘gospel (good news) of the kingdom’? The answer is quite simple, and yet, it is overlooked or ignored by the vast majority of commentators. That coming destruction was “good news” because the end of the Old World was to be the full arrival of the New World! (This totally falsifies the horrid “Israel Only” false doctrine!). In Isaiah the “death” of the Old Covenant people would give birth to the new people with the new name. Was that bad news? Well, from one perspective, of course it was, because the new people could not be created until the old people were slain! This is a bad news / good news scenario! In Isaiah, the end of the Old Creation would give rise to the New in which LIFE and blessings would abound! This is- when properly considered– a stark contrast with the Old. Under the Old, sin and death reigned. But, in the New Creation, life is the key element! What wondrous news! In Isaiah, we are told that the Old Creation would no longer be “remembered.” The word that is translated as “remembered” is zakar, and carries with it tremendous covenantal connotations. Jason Meyer calls attention to this: “‘Remember’ is a common term associated with covenants. It does not mean that God forgets and needs a reminder. The verb could be idiomatically rendered ‘to act in order to fulfill the covenantal oath or obligations.” (Jason Meyer, The End of the Law, NAC Studies in Bible and Theology, (Nashville, TN; B and H Academic, 2009), 245, n. 41). Meyer was not commenting on Isaiah, but, his observation is valid nonetheless. 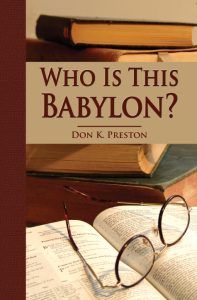 See my discussion of “remember” in my Who Is This Babylon? book. This is a very important issue. The word “remembered” is a key element in the doctrine of the New Creation! What this means is that when the Lord said that the first “heaven and earth” (and by implication, the first Jerusalem) would no longer be remembered, He was saying that the first creation would lose its covenantal standing! It would no longer be “remembered” before the Lord in the same covenantal sense. This is just a way of saying that the Old Covenant Creation would pass away, to give way to the New Covenant Creation! It proves that the Old Creation was a covenant creation. And, the New Creation would be everlasting. It would never pass away (Isaiah 66 / Matthew 24:35)! It is indisputably true that Isaiah 65 predicted the New Creation. It posited that New World at the time of the passing of the Old Jerusalem. It shows that the Old Creation was a covenant creation. It is not focused on material, physical creation! I suggest that what we have in Isaiah 65 and Matthew 24 are parallel passages. Jesus’ prediction in Matthew 24 is drawing from the Old Testament predictions like Isaiah 65-66. (There are echoes of Isaiah in the Olivet Discourse to be sure). In the Tanakh, there is the repeated, emphatic narrative that the New Creation would come at the time of the termination of the Old Covenant World of Israel. Jesus was obviously knowledgeable of this. This book discusses the New Creation– the New Covenant World of Christ– as the good news of the passing of the Old Creation, i.e. Old Covenant Israel.